There are two main types of cherries in commercial production – sweet and sour. Of these, the sweet variety are the juicy, sticky finger type, and Bing is one of the most popular in the group. In the Pacific Northwest, the largest supplier of cherries in the U.S., growing Bing cherries has become a bankable endeavor, as it is the most widespread commercially available cultivar. 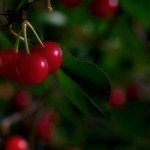 If you have or are going to acquire one of these tasty fruit trees, continue reading for tips on Bing cherry care. Deeply red, heart-shaped fruits with a taste of summer and the promise of pie. I’m talking about Bing cherries, of course. The variety was first introduced in 1875 in Salem, Oregon and has become one of the most economically important cherries. 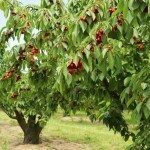 Bing cherry trees thrive in temperate regions and bear 4 to 7 years from planting. Learn how to care for a Bing cherry and you could be enjoying backyard fruit in just a few years. These cherry trees are hardy into United States Department of Agriculture zones 5 to 8. The tree can get 35 feet (11 m.) tall, but if you want a dwarf variety, these only grow 15 feet (4.5 m.) tall. The plant has a medium growth rate and produces a rounded canopy with smooth, reddish bark marked with horizontal corky stripes on the trunk. The leaves are dark green and up to 6 inches (15 cm.) long with serrated edges. The tree needs another sweet cherry as a pollinating partner and has a chilling requirement of at least 700. It blooms in early spring with a mass of perfumed white flowers. Fruits arrive around July. 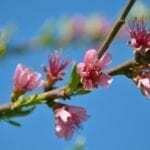 Bing cherry trees need a full day of sunlight for best flower and fruit production. They also require well-draining soil that is a touch on the sandy side. After planting, keep the young tree moist, as cherries are not drought tolerant. Remove competitive weed pests and apply mulch around the root zone. An important part of Bing cherry care that helps form an open shape and sturdy branches is pruning. Prune your cherry tree in late winter. This will spur the growth of new fruiting wood. Feed in spring until the tree starts to fruit. Bearing cherry trees are only harvested after the season. Black knot and bacterial canker are two common diseases of cherry. Remove any infected plant material as soon as lesions are observed. Use appropriate pesticides and sticky traps as needed during the season. If you want to protect all those sweet, finger-licking cherries, a bird net is your best friend. They are easy to use and prevent much of the pirating of your fruit. Harvesting Bing cherries may take up to a week since the individual fruits sweeten and ripen at just slightly different times. The ones to pick are deeply, uniformly red. Cherries will not ripen once off the tree, so if you have any doubts, taste a couple to make sure they are sweet enough. Take the stem with the fruit if you plan on using the fruit later. Store cherries at 32 degrees Fahrenheit (0 C.) for up to 10 days. Perforated plastic bags will keep them freshest. 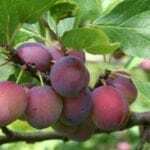 If you have a bumper crop and can’t eat them in time, try freezing the fruit. Wash, de-stem and place cherries in a single layer on a cookie sheet in the freezer. Once frozen, transfer them to plastic bags and store in the freezer.